Alzheimer’s Disease and Decision Making: Do I Know You? Ms. Wilson, a Certified Senior Advisor, specializes in working with family and professional caregivers to navigate healthcare and aging concerns. Visit PamelaDWilson.com. A spouse experiencing the same response may feel the sting of rejection or the absence of appreciation after a lifelong marriage of commitment and caring for a husband or wife experiencing memory loss. These practical questions should be a priority in addition to the more difficult discussions of creating memories today so that when memory does fail, the family has something tangible by which to remember a loved one: photographs, family recipes, discussion about the family tree, my wishes for what happens when I don’t recognize my wife, brother, sister or children. Denial and delay of these discussions—not talking or thinking about end of life— permits family members to avoid these all important but difficult conversations that result in conflict later as the disease progresses. My husband wants me to take him skiing and point him in the direction of a steep cliff. I hear other individuals say “put me somewhere and go on with your life.” Those who love the outdoors desire to go camping and have an adventure from which they don’t return. One might wonder how sincere these statements are and if there truly was a change in situation would the request change to desiring care rather than desiring to quickly end to an unpleasant situation. What would you want for your spouse? 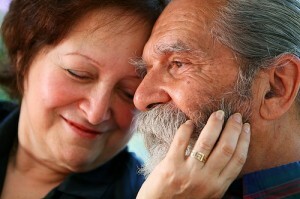 The dilemma of a community spouse caring for a spouse with dementia or Alzheimer’s is rarely discussed. Marriage is supposed to be forever. Many spouses in a marriage affected by dementia or Alzheimer’s disease feel guilty if they seek out companionship and loudly hear from others that they should remain dedicated to their marriage regardless of the condition of the spouse diagnosed with memory loss. This, like the prediction of what will happen as the result of a diagnosis of memory loss, is an unusual situation with no usual. There are no right or wrong answers only actions. Her new book, The Caregiving Trap: Solutions for Life’s Unexpected Changes, will be available on October 6, 2015 through all major bookstores as well as on PamelaDWilson.com. You can find her on YouTube, Facebook, Twitter, and Linked In.